Since genetically modified organisms (GMOs) have evolved to be a top consumer food issue, five major food corporations are on board to label it. 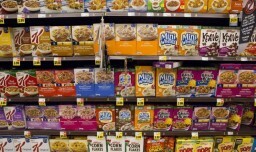 This big step is thanks to the state of Vermont, which has essentially boxed big food companies into a corner after the stated passed legislation requiring labelling nearly two years ago. Earlier this month, congress failed to pass an industry-supported measure that would have created a voluntary national standard for labelling which would have pre-empted Vermont´s law. Now, the big food companies have a 1 July deadline to comply which their GMO labelling mandate. Vermont Senator and Democratic presidential candidate Bernie Sanders has said in a statement that he is proud that Vermont took the lead nationally to make sure people know what is in the food they eat.